What a wonderful variety of techniques and finishes on the altered bottles that were entered into our July ePlay Challenge. It was delightful to see such creativity and imagination in action. Thanks so much to all who entered and shared their creations with us. We loved the Mini Memory Jar that she created from an old Rolaids jar. The embedding of tiny treasures into the modeling paste created a wonderful effect. 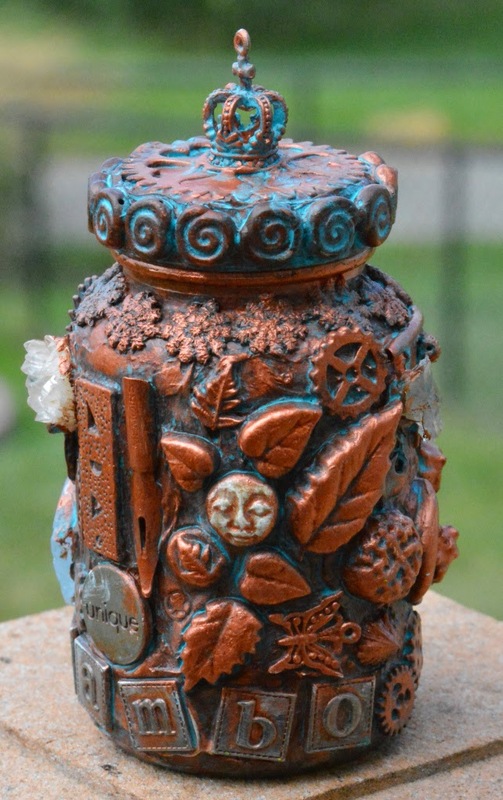 The patina'd look from the copper and turquoise gave it a lovely aged look and highlighted every detail. Congratulations, Sambo's Craftart! Please contact Kim at kim@eclecticpaperie.com to claim your $25 gift certificate prize. We would also like to make special mention of two other projects which were entered into the altered bottle challenge. We loved the beautiful clay flowers she created and the lovely dry brushed metallic finish. So striking! Lisa's altered bottle features fabulous texture from trims and twines, beautiful G45 paper, and a gorgeous topper. Love the Asian feel to the project. Well done and congratulations to all three! Our next ePlay Challenge will begin on the first Thursday of the month which happens to be August 7. Hope we see you there! Thank you Bonnie for the special mention, I so love the creations by Sambos Craftart and Lisa S...off to have a look at their blogs!! !Congratulations to Sambos Craftart and Lisa S !! Stunning bottles! Well done everybody! Congrats to the winners. You all did a fabulous job on the altered bottles. Love all 3 and would have a hard time if I had to choose a fave. But love to soak inspiration !! Thanks a lot for sharing your art. WOW! I'm so honored. I really never imagined getting such praise. All the bottles were so lovely. Thank you EP for sponsoring and congratulations to Suman Pandit and Lisa S. Thanks everyone for all the lovely comments as well. I've been making my rounds - ever so slowly. You all do such lovely work! !